It’s one of those moments that screams, “How did I get here?” The methods of transportation are easy to explain: a 10-hour flight from Vancouver in one of Lufthansa’s finest aircraft (see sidebar), followed by a two-hour bus ride into the mountains on a road that feels a bit like if the Sea-to-Sky and the Highway to Hell had a baby. But the view of Southeast Germany on a clear May afternoon is another matter. Below me are rolling hills as far as the eye can see; The Sound of Music was filmed a half-hour drive from here. About a kilometre above stands a small house at the apex of the mountain range. Called Kehlsteinhaus, it’s known in English as the Eagle’s Nest and was a well known gathering place for the Nazi Party. 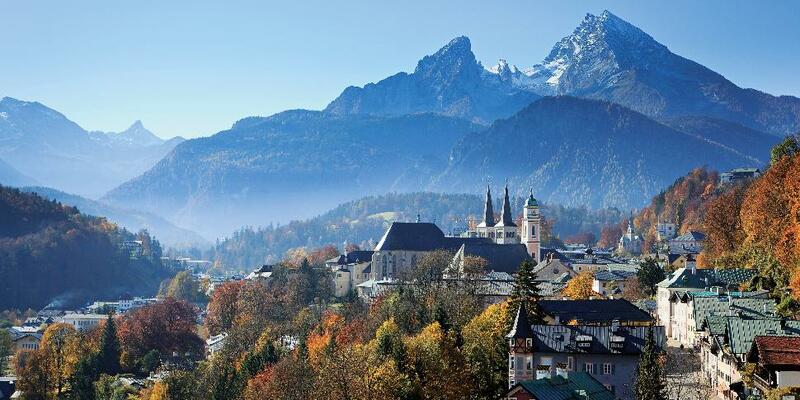 This is the scene at Kempinski Hotel Berchtesgaden, up the road from Munich, Germany’s third-biggest city. The comparisons between Berchtesgaden, with its population of some 7,600, and Whistler are obvious: it’s a top ski destination surrounded by pristine bodies of water, and tourism is the lifeblood of the economy. But B.C.’s favourite winter wonderland lacks the old-timey charm of Berchtesgaden. And while some aspects of the Bavarian retreat’s history are undoubtedly regrettable (thanks to historical museum Dokumentation Obersalzberg and its 170,000 visitors in 2017, the village doesn’t shy away from its past), others have aged well. 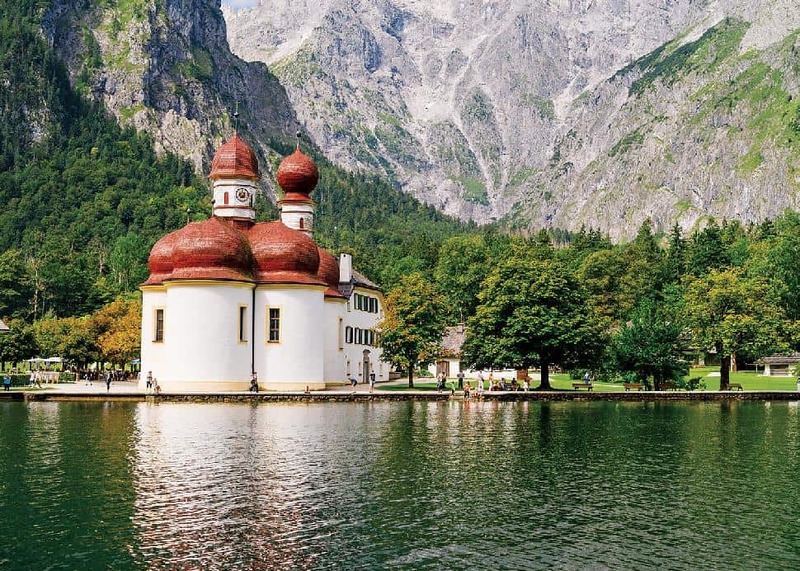 A trip across a lake named K.nigssee, for example, yields the Church of St. Bartholom., built in the 12th century, plus a family-run food stand specializing in smoked trout on a bun. (Just don’t ask for WiFi.) The right to fish in the lake is passed down from generation to generation, with only one person holding the right to catch at any given time. Not a bad business model. Speaking of which, two other notable commercial endeavours in the region that have stood the test of time are lederhosen clothier Engelbert Aigner and the Grassl distillery, which specializes in schnapps. The latter is Germany’s oldest distillery, open since 1692. Grassl doesn’t use any aromas or perfumes for its schnapps, either; they’re all-natural, to the point that many of the shop’s specialty products are still made up in the mountain ranges and barrel-aged for three years. Berchtesgaden has also cornered the market on a certain Olympic sport with a massive luge/bobsled track that German athletes flock to in all seasons. It seems like a perfect little paradise, but as with all such places, our time here is too short. After another bus ride through the mountains, we arrive in the capital of the state of Bavaria. Spotless Munich is one of the richest areas of Europe, but there are some eccentricities amid the beautiful buildings that shape the city centre. Perhaps chief among them is the Rathaus-Glockenspiel, basically a huge merry-go round, attached to New Town Hall. At 11 a.m. and 5 p.m. (and at noon in the summer), bells chime and figurines rotate, playing out scenes from German history. There are other pockets of weirdness. A Michael Jackson memorial gets a significant amount of play, and no one’s sure why it’s here. But the shrine is still nicely maintained, with fresh flowers complementing the photos and news clippings. And although landlocked Munich is miles away from the nearest beach, it’s known for its downtown surfing. 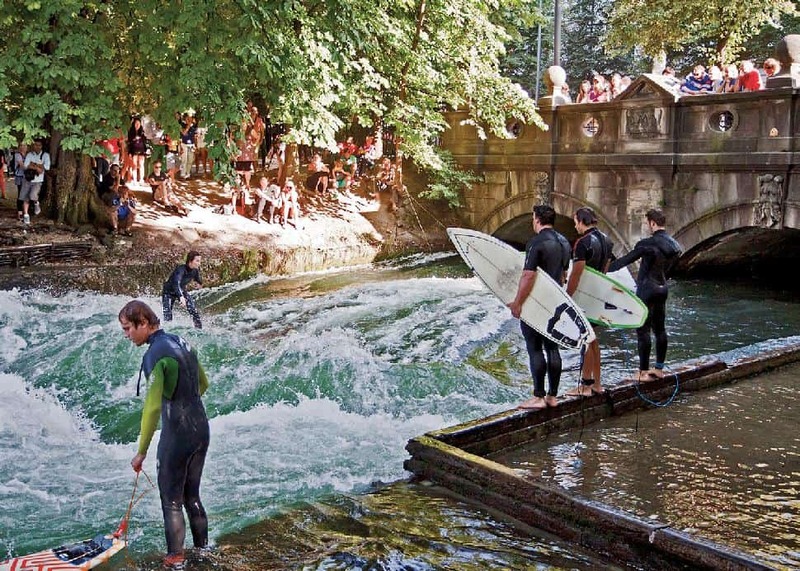 The Eisbach, a man-made river that runs for two kilometres through the city, is a hot spot for surfers who come from around the continent to ride the waves. It’s also popular with tourists, offering plenty of prime viewpoints for watching those brave enough strut their stuff. Munich is a collision between old and new, as the state capital grapples not just with its past but with the changes that modernization brings. Many antique structures stand tall, while new shops and fancy hotels increasingly surround them. One thing that hopefully will never change in this town? The beer. Augustiner-Bräu has been marrying water, malt and hops for 670 years, and when I step through the heavy doors to the brewery’s accompanying restaurant, I’m transported to a simpler time. There are no bigscreen TVs, and all the tables are long, not so much encouraging interaction with fellow customers as demanding it. The attitudes are from another era, too, as a server takes my order of a lager and a weisswurst (white German sausage made with minced veal and back bacon) and jokes that the table of women sitting nearby, dressed in traditional German dirndl skirts, could help me cut it. Last May, German airline Lufthansa launched its first direct flight from Vancouver to Munich, on an Airbus A350-900. Planes now leave daily, and passengers fly in style. The aircraft’s curved wing means that it uses 25-percent less fuel than its competitors, with lower cabin pressure, too. Then there’s the LED lighting system, which adjusts according to the time where the flight originated. Perhaps most surprising, the plane’s economy class section has won awards and is actually an enjoyable place to be. As sweet as the ride in is, the destination–Munich Airport–might have it beat. 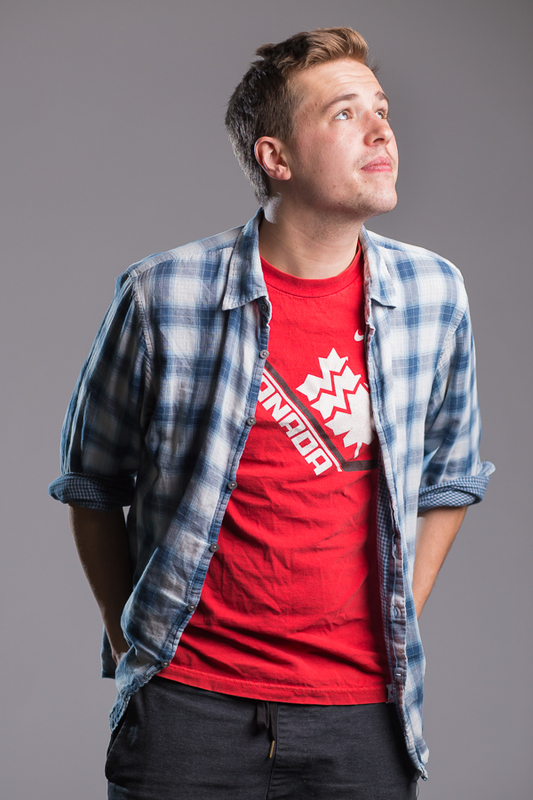 YVR gobbles up accolades, but does it have a Little Italy section? Does it have replicas of local sports stadiums? Does a Porsche whisk first class passengers from the plane to the gate? Munich Airport is home to more than 50 restaurants, including Schuhbecks, run by Bavarian celebrity chef Alfons Schuhbeck. Yes, one is a McDonald’s, but “even that’s quite nice,” according to an airport employee.